Bruce covered the song at least one time in september 1967 with the Castiles at the band’s second gig in the 'left foot' in Freehold. George Theiss takes the lead vocal on this song. Only 26 minutes of the band’s 60-minute performance exists on the original master tape. The tape inclused San Fransiscan nights. Keep in mind that only a small amount of setlists of the early years has surfaced, so it may have been played a lot more. One show, double bill, with The Castiles headlining. This was The Castiles' final appearance at The Left Foot. Although having only opened in September 1967, The Left Foot’s popularity dropped dramatically in March 1968 when the larger, trendier Freehold Hullabaloo club opened nearby. The Left Foot closed for good in April 1968. The 13-song mentioned setlist represents The Castiles’ complete performance at this show, in the correct song sequence. 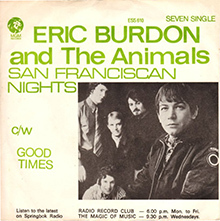 "San Franciscan Nights" is a 1967 song performed by Eric Burdon and The Animals. 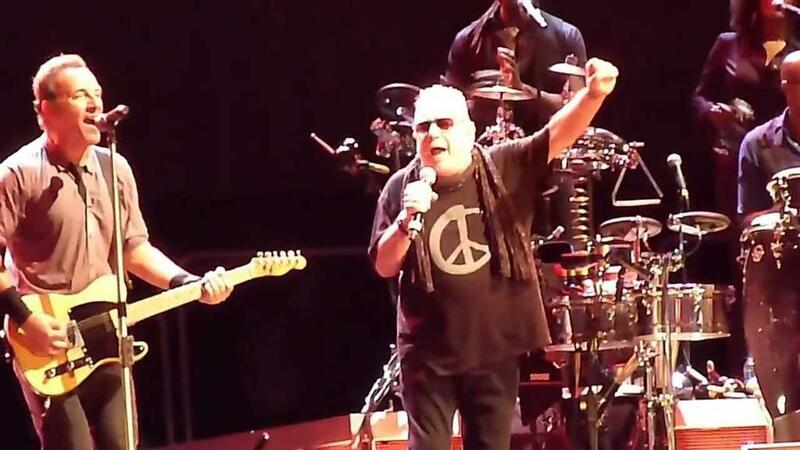 The band wrote "San Franciscan Nights" themselves as a protest song against the Vietnam War. Looking back on the tune in a 2010 interview with Songfacts, Burdon said: "The 'Love Generation' helped the anti-war stance in the States. It certainly turned a lot of soldiers' heads around, making them wonder why they had to be out fighting a war when back home their girlfriends were frolicking around and it caused a lot of anguish on that level. Maybe it helped politically with the so-called enemy. I'm not sure." The song opens with a brief parody of the Dragnet theme. This is followed by a spoken word dedication by Burdon "to the city and people of San Francisco, who may not know it but they are beautiful and so is their city," with Burdon urging European residents to "save up all your bread and fly Trans Love Airways to San Francisco, U.S.A.," to enable them to "understand the song," and "for the sake of your own peace of mind." The melody then begins with lyrics about a warm 1967 San Franciscan night, with hallucinogenic images of a "strobe light's beam" creating dreams, walls and minds moving, angels singing, "jeans of blue," and "Harley Davidsons too," contrasted with a "cop's face is filled with hate" (on a street called "Love") and an appeal to the "old cop" and the "young cop" to just "feel all right." Pulling in as many 1960s themes as possible, the song then concludes with a plea that the American dream include "Indians too."